My work in progress. I started learning to knit in August or September. All through September, October and November, I knit. 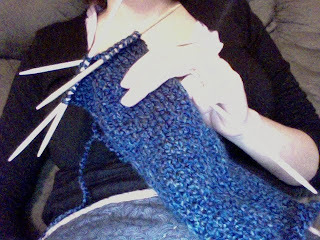 I knit and knit and knit. So far, I haven't gotten burnt out. I have figured out that my skin doesn't like acrylic. It's causing my psoriasis to really act up. I'm currently making sure to have a barrier between my skin and the yarn. This is a gift for my cousin. I'll post pictures when they're done.